Single handle: A single handle faucet is able to offer easy and quick temperature adjustments and water flow using one hand, which is highly beneficial if you are using the other hand elsewhere. A faucet of this type is likely to require one or more sink holes, and this is likely to depend on the style and layout of the sink. Two handle: These are able to offer precise control over the water flow adjustment and temperature and splits control for the cold and hot water. Pull-out: If you would like a faucet able to offer a great combination of functionality and style, a pull-out kitchen faucet is likely to be the perfect option. The modern trend is to install copper sinks to the kitchen. But, why? Paying such a large amount of money for a mere kitchen sink! Some would raise their brows high up as if you’ve gone mad. The reason is that most people do not know the real medicinal, aesthetic and chemical value of a copper sink. Very few people know how copper could cure skin diseases and how it kills harmful microbes. Here are some more advantages of having a copper sink in the kitchen. I’m sure you’d love to pay for one at the end of this article. So, let’s read on. All we need from a kitchen sink is the easy-to-use nature and elegance. Mexican hammered copper kitchen sinks satisfy both these needs and add a valuable, luxurious look to the kitchen. They go with the interior settings while filling it with a bit of royalty. In fact, copper, gold, bronze and sliver are metals always associated with royal families. Installing a copper sink in the kitchen is a certain approach to the royalty. Apart from that, it’s yet another way to improve the natural, artistic look of the kitchen. Usually, a copper kitchen sink is as heavy as 50 pounds or even more. This weight ensures a high durability. It does not ware out soon. And it’s made especially by hand hammering thick pieces of copper in order to withstand heavy work. So, it’s more durable and stronger than ceramic or steel sinks. Also, no staining or color changes happen as long as it stays as a living metal. 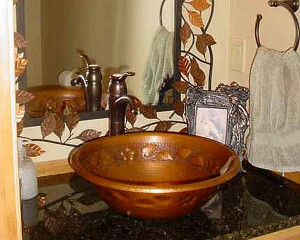 When buying a copper sink you must make sure that the surface is not coated with any paint or anything to preserve it. If it’s coated, the potentialities of that ‘living metal’ is gone for good. Mexican copper sinks are more spacious than others. You can put even a huge pan into it and wash with ease until the dirt is completely gone. Since it has ample room inside the sink, no water is spilt out. So, the kitchen floor is kept dry without a drop of water until the end of the washing process. Cleaning a copper sink is much easier too. Just a touch of soap and a spray of warm water would do their best in cleaning. You won’t have to go on rubbing, rubbing and rubbing. That’s why copper sinks always excel in functionality and maintenance. Do you still have doubts about buying a copper sink? Never hesitate to do such a favorable investment. Better to buy a Mexican hammered copper sink to brighten your kitchen with an ancient, yellowish copper glow. For many years copper has been the main raw material used by the Mexican artisans of Santa Clara del Cobre for the fabrication of their beautiful artisan items. Originally artisans relied on the natural supply of copper of their lands for the fabrication of their items. But has the supply of the original sources has decreased and the demand for items as copper sinks has increased they have had to think and look for new and alternate sources of copper material. Thankfully they have found a reliable source of copper in the recycling industry. Trucks loaded with tons of copper junk coming form many parts in central Mexico arrive every week and deliver their precious load to the artisans shops. Artisans pay the load of copper according to the cleanness of the material, the cleaner your copper the closer you will get to be paid at international market prices for pure copper, that lately has been increasing steeply making this recycling business more profitable for the copper gatherers. Though all junk serves, artisans specially avoid junk made of copper wires covered with too much soldering due to the harming potential that this impurities have for the very characteristic look of their handmade copper items. The high demand and good price paid for copper junk has created a new industry of copper gatherers in central Mexico with a number of benefits for the environment turning old useless junk yards into a profitable mine of copper and preserving natural copper sources for more strategic applications. And at the same time it has also benefited the economy of the abundant population of this region of Mexico that has seen a growing industrialization in recent years. For thousands of years copper has been present in the development of the major civilizations of the world. Even now copper is one of the most used metals in a great number of areas of our contemporary life. The common uses of copper are wide and various, they go from the pipes in our kitchens and bathrooms to the wiring of the electric web across our cities and the country. But these are not the only places, not the only forms copper can be present in our lives. For many centuries, artisans of a small town in Mexico’s western mountains have made a living of making beautiful pieces of art from raw pieces of copper. These art pieces can take many forms; jars, flower pots, plates, sinks and yes; also beautiful handmade copper bathtubs. These bathtubs are made entirely from a few raw copper plates which are previously softened with heat from a wood fire and then, once the proper softness has been reached, they are welded one onto each other to be then hammered until the desired copper tub shape is attained.